Posted May 13, 2017 . Filed under Uncategorized. Bournemouth University welcomed the world renowned independent scientist James Lovelock FRS this week. James took part in a question and answer session organised by Dr Iain Green, one of the conveners of the Environment & Threats Strategic Research Group. 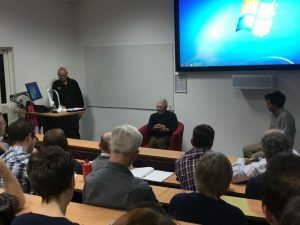 James was able to give is views and share anecdotes on a variety of subjects, ranging from where he gained inspiration for the Gaia theory to the future of nuclear energy, in this exceptionally inspiring event. During the session, James lamented the lack of multidisciplinary research in Universities, which is something the Environment & Threats Strategic Research Group was formed to address!